Moscow - Russia set out its development goals until 2012 this year, but the four-year budget plan hardly matched reality - something which even the Finance Ministry had to admit. Economists have halved the country's growth forecast as the real cost of the credit freeze and a dive in the price of Russia's main export commodities set in, but Moscow appears to be rolling ahead with an expansive foreign policy and ambitious domestic infrastructure and social spending. While governments all over the world scrambled to legislate bail- outs for flagship sectors in distress, Moscow's initial reaction was to cast the country as immune to the crisis. The 2012 plan boosts spending, including by 50 per cent for defence. It aims at development "matching Russia's status as a leading 21st-Century world power," the document posted on the government's website read. But the budget is based on an oil price of 95 dollars per barrel. Now, with prices at half that, there is a looming 1-trillion-ruble (36-billion-dollar) shortfall, officials say. But this is to be made up by digging into Russia's rainy-day stash of oil-windfall reserves. Finance Minister Alexei Kudrin, who created and defended the Reserve Fund against populist spending grabs, has indicated just how seriously the crisis has hit home, with his announcement that now that rainy day had arrived. He warned in a cabinet meeting that growth will not top 3 per cent and scaled down the oil price forecast to 55 dollars per barrel. President Dmitry Medvedev signed the bill into law while on a high- publicity diplomacy junket in South America, a trip aimed at re- asserting Soviet-era ties in Washington's traditional backyard. A visit with Soviet-ally Cuba and joint military exercises with Venezuela in the Caribbean were highlights of a trip that analysts said amounted to Russia's response to what Moscow sees as US meddling in its former Soviet satellite states and US plans to deploy missile- defense system in Eastern Europe. At home, powerful Prime Minister Vladimir Putin pledged to follow through with huge investment to overhaul of the dilapidated Soviet- era roads and hospitals and also promised mammoth social spending. "We have amassed sizable financial reserves that will give more freedom to maneuver, allow us to preserve macroeconomic stability," Putin said in a speech on November 20. "We have a responsibility to emerge from the crisis stronger and more competitive." Such assertions run in the face of Finance Minister Kudrin's own numbers in which he believes Russia's financial safety cushion will be deflated in three years at the current rate of spending. The official white-wash is at least in part an effort to prevent a run on banks by many who still harbor painful memories of the state's near-bankruptcy in 1998, when the life savings of millions disappeared overnight. Putin vowed to do "everything" to prevent the kind of financial crises that shook the country after the collapse of the Soviet Union. Nearly half of Russians now worry about losing their jobs in the next three months, state-pollster VtsIOM showed in a survey released in early November. Those fears that looked to materialize after Russia's unemployment agency said manufacturing and retail firms planned 200,000 job cuts. Russia's jobless rate rose to its highest in seven years, 6.1 per cent - a shock in a country where wage averages have risen sixfold and the workforce ballooned while growth held at a steady 7 per cent average over the last decade. Medvedev has peppered his discourse with long-shot hopes of Moscow maturing into a leading financial hub, the ruble developing into a regional reserve currency and Russia becoming a national lender of last resort and an actor in a new OPEC-style gas cartel. But the crisis looks to have particularly painful dimensions for Russia. It faces slumping profits in energy and metals exports, highly-leveraged corporate accounts, increasing capital flight, a real estate bubble ready to burst and pressure to devalue the ruble after the government has had to burn through over 20 per cent of its foreign exchange reserves since August. Moscow may now exhaust its prudent financial reserves to keep afloat, but with governments all over the world dipping into the red ink, some observers point out, that may not be such a bad approach. My reaction: I didn't just highlight my sister's article to show her journalistic talents. I also wanted to point out an interesting dynamic that isn't good for the dollar. It is impossible for China to finance the ballooning trade deficits around the world. China will have to give up its dollar peg, and it knows it. 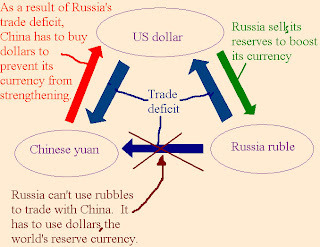 This entry was posted in Currency_Collapse, News_Developments, Russia, Trade_Deficit. Bookmark the permalink. Impressive brother sister team of writers. Congratulations. Wow! Quite an impressive analysis. Do you think that China will lose it's dollar peg soon? I'd think a collapse in the US Treasury prices would trigger a dollar collapse. US Treasuries -- the last American Bubble. The Last American Ponzi Scheme. With real estate you could at least claim to be buying something with _some_ value. But US Treasuries? It's sell-to-the-bigger-sucker par excellance. Nothing whatsoever of value there. Ponzi in its truest form. I love it! Buy silver + gold before you can't anymore. Yes, I believe China will drop its dollar peg. A selloff in treasuries would force China to take action, and the treasury bubble will burts soon as gold trends higher and the dollar trends lower.